Powerful words from the Lord Jesus on the Cross. As He was dying the most agonizing death possible, His focus wasn’t on Himself, but on others. Jesus’ enemies had sentenced Him to death, lied on Him, spit on Him, beat Him, and worse. Yet as Christ hung on the Cross He didn’t ask the Father to obliterate and torment His enemies, He asked the Father to forgive them. The love of God was flowing through His heart. God has called you to let His love flow through you. People have wronged you. People have hurt you. But put the shoe on the other foot. You have wronged the Lord on many occasions. You have hurt Him several times. But He always forgives you. 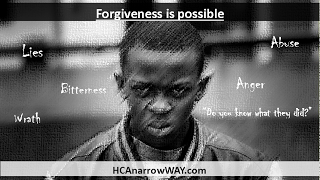 Who are you to not forgive someone after all Christ has forgiven you for? Let it go in Jesus’ name and move on. Thanks for posting this... so true. :) God bless. Amen! Bro. H.C., We are going to be offended many times before Jesus Christ returns. We must be a peace with this truth because we must forgive no matter how many times we are wronged. We should not take it personally by being sensitive but we should allow God to work through us so he can maybe perhaps save the individuals that offend us. We should want to show forgiveness since we desire our Heavenly Father to forgive us. Thank the LORD for Jesus Christ, who forgave us for our sins and we are free to let go! Thank you for sharing.